What do you love? TechRadar, right? Google has snuck out a new service, dubbed What Do You Love?, which allows you to search for whatever you love across all of its various properties at once. So, telling Google that we love hats brought us images of hats, hat patents, nearby hats, news about hats and a quick and easy option to set up Google Alerts about hats or to email someone about hats. All this and more crammed onto one long dashboard-like page, with the various widgets changing order with every new search. You can then click the Gmail icon and Google will create a slightly twee email for you to send your friends, which comes with the subject line 'Hey this is awesomely awesome' and describes the service as a 'wonderful things dashboard'. 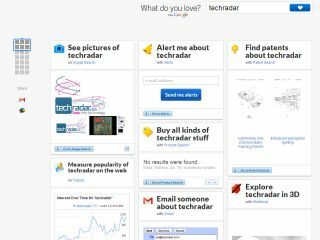 A wonderful things dashboard, perhaps – but it serves more as a tool for Google to point you in the direction of lesser-used products than just search. What's strange is that Google hasn't made much of a fuss about the new service, which seems to be completely up and running at www.wdyl.com.